It was a spur of the moment trip to a small lake far away, over many hills and through scenic valleys passing plenty of other fishable lakes and rivers along the way. Our destination had been chosen however and for a good reason, if we played our cards right there was a real chance at a trophy brown or rainbow. 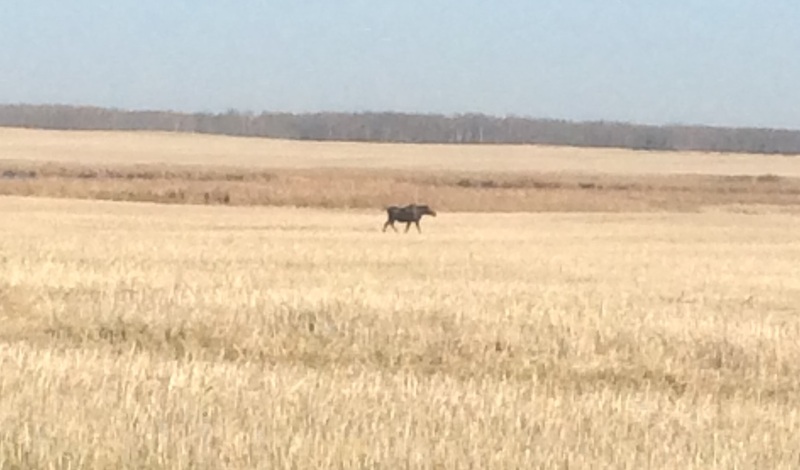 A few hours into our drive up late in the evening we spotted a bull moose near the road and stopped to watch for a few minutes. Within three kilometers of driving off we spotted the female he could have been potentially following. 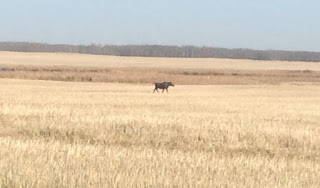 (the one pictured above was on our drive home, the quality in the pic isn't there however) Our moose populations are in trouble and it was a real pleasure to see them. The wind had been pushing from the north for most of the drive mellowing out by nightfall and after four and a half hours of driving we were at our motel. Looking up the sky was void of clouds, stars shone bright and a tiny sliver of moon crept towards the west. We were awake early with more than enough time to get to our shore spot and were greeted with calm water and temperatures a few degrees below zero. Brrrr! I began by casting a small spoon in hopes of a big brown trout and quickly found out just how thick the weeds were near shore. This would limit our available techniques but we were not discouraged. As daylight slowly showed itself the trout began to occasionally breach and it was instantly evident the size of some of them. We knew they were there and it was prime time, now we just needed one to strike. It was clear the thick weeds would pose an added challenge but within 30 minutes of our start my wife had the first rainbow of the day on the end of her line. 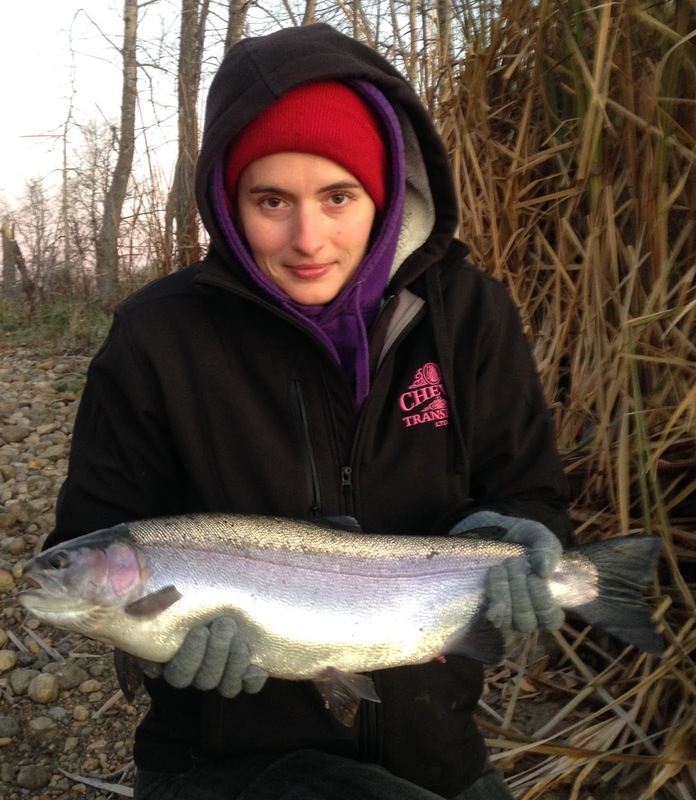 It immediately peeled off to deeper water as she tightened the drag and began taking line back. This fish was strong and smart breaching the water fully many times and thrashing its head before getting close to the weed line where it dug in deep. She was sure she had lost the fish but I told her to keep fighting it and sure enough through the weeds and to the net came a beauty 22 inch bow. After an easy side of the mouth hook removal and a few pictures it released with minimal revival needed. Success early on made the chilly temperatures and hassle of removing the ice from the rod guides a simple challenge to overcome. The iced up guides would pass soon enough as the day warmed. As the day got brighter, how thick these weeds really were became very evident as the water was crystal clear. I decided to try and walk the shore looking for a less weedy area and just as I found one, my wife whistled the indication of a fish on and back I ran to net it. This one fought harder and when it broke the surface it was easily bigger than the last one, sadly with the second breach it was able to shake the hook. The frustration was evident but we had plenty of time for redemption so we moved over to the next spot where the weeds were not quite as thick and continued to fish. Already having found something they would hit, we were full of confidence and within the hour my wife hooked, fought, landed and released a plump 24 inch Rainbow. She was really showing me how it's done as all I had so far was one visible follow from a nice Brown and a missed bite. The wind picked up as lunchtime rolled around and a group of fly fisherman showed up fully geared for the region. Some of them ended up being a little louder than I would think is warranted on such a small lake and I couldn't help but think that some two way radios could have benefited them. With the wind and added noise it seemed the bite went from all out slamming the offering to peckish nibbles and subtle tastes within the afternoon. We always try to do our best staying quiet when fishing in general, when pursuing trout from shore it seems even more important. 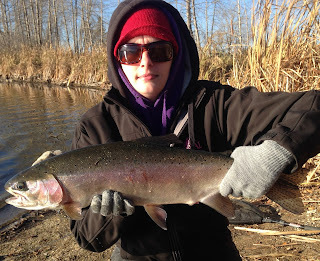 My wife landed and released what I would consider an eater sized rainbow in the middle of the afternoon but the action was not stellar until 2 hours before dark. It was a long wait but well worth it. With a pair of big browns cruising the shallows in front of us clearly not interested in anything we offered, (follows are exciting though) I went back to my floating paste set up and had a very subtle take within 30 seconds of casting out. I set the hook and the fight was on, the rod was bent right over with the weight and strength of the trout on it's run and all I could think about was please don't shake it. After a few leaps and bulldogging runs through the weeds we had it to shore and in the net. It measured out at 22.25 inches and shot off on the release before we could snap a good in the water shot. 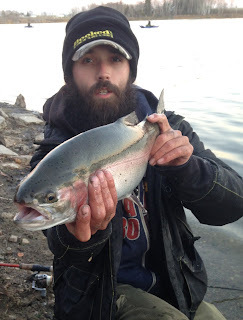 Time on our day was running out and I hooked into but lost one more trout before it became to dark to fish. The wind stayed consistent through the night and the following morning we tried a few spots from shore with minimal success. I hooked into and again lost a pair of trout, they aren't dumb and most have surely been caught at least once. The bites we were getting were very hesitant and around lunch with a long drive home ahead of us, we decided to head on. We took our time on the drive exploring a few familiar trout lakes on the way as well as scouting about a dozen potential fishing spots I had found on maps with varied success.